Active Man Multivitamin, 90 Tablets each (Nature's Wonderland) - Penn Herb Co. Ltd. 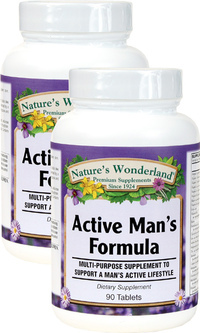 Active Man Multi is a comprehensive blend of super foods and power herbs to fuel the active man's lifestyle. It supplies all the essential vitamins and minerals men need plus energizing Ginseng, prostate-nourishing Saw Palmetto, libido-boosting Tribulus and other male vitality nutrients. Pygeum, Saw Palmetto...Support prostate comfort and healthy urinary flow. Maca, Tribulus...Boost testosterone levels and revv up your libido. Passion Flower, Hops...Manage daytime stress and tension. Get results you can feel with Active Man Multi! 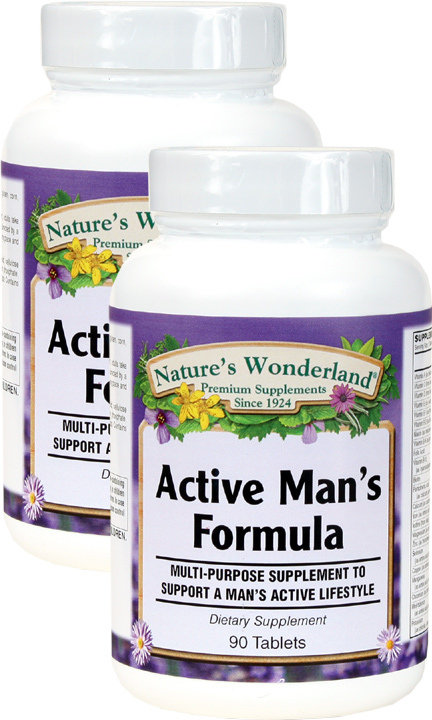 Power-packed multivitamin-mineral-herbal formula supports male health & vitality; supports prostate health; supports energy and immune health; promotes stress relief.